The Model 199-CRR is a medium duty chain driven roller conveyor used for conveying in a variety of industries, in light to medium duty pallet handling. It produces a positive drive that aids in many manufacturing processes. Its roll-to-roll chain drive makes it ideal for light and medium duty pallet handling in oily conditions unsuitable for belt driven live roller conveyor. 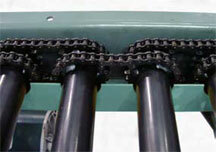 Note: In this photo, the chain guard was removed to illustrate roll-to-roll drive chain. Do not operate conveyors with the chain guard removed. Rollers-2-1/8" dia. x 1/8" wall unplated tread rollers spaced every 4", 6", 8", or 12"
Capacity-Maximum load per liner foot of conveyor; 150 lbs, not to exceed rated capacities. Maximum conveyor length; 100 ft. The 199-CRRC is a chain driven live roller curve that aids in alignment of packages, cartons, etc., through 30°, 45°, 60°, and 90° curves. Can be used in conveying oily parts.